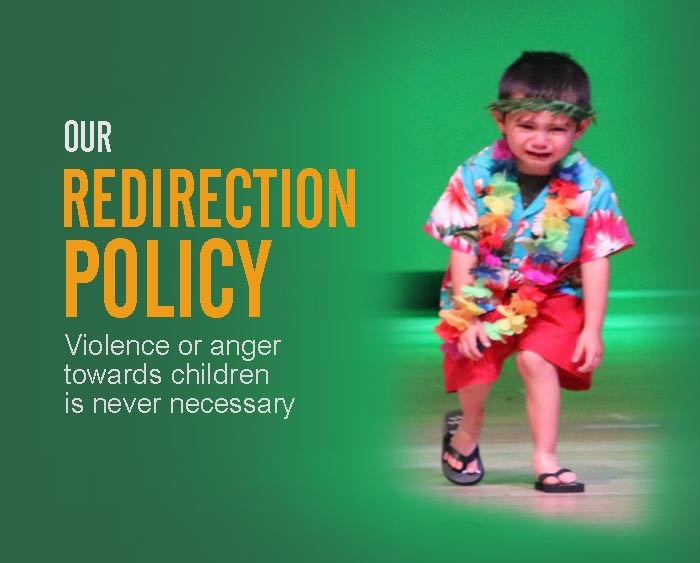 When children are disruptive or out of control, they may need to be removed from the situation for a few minutes. One to five minutes depending on the child’s age. (No more than five!). This could be a particular chair or quiet spot as the time-out place. This is a calming device for the child and the teacher. When the time out is over, communication with the child is followed through with an activity. When children scribble on the wall, we give them paper and crayons. When they race dangerously indoors, we take them outside for a game of chase. When they throw books at each other, we gather them for a story or organize a bean bag toss game. Another strategy we use is asking children to help fix up the results of their actions. If they throw or spill food, we calmly offer them a cloth to clean it up. If they break a toy, a suggestion is made that perhaps they can help fix it. If they make another child cry, have them help with the soothing and make it a learning experience. Upon visiting a Montessori classroom for the first time, one might wonder what magic spell has been cast upon these young children making them so calm and self directed. Another person might look at that same class and be confused by the children'’s independence, wondering where'’s the discipline, these children just do as they please. Visitors commonly issue such comments as, '“I'’ve heard Montessori is too free and chaotic'” or '“I'’ve heard Montessori is too structured. '” It does not seem possible that these two extreme opposites can both be true. Montessori is, however, all in the eyes of the beholder. Got a Bossy Bessy on your hands? Tired of the tantrums? Wondering if time-out really works? Learn the how and the whys of your preschoolers' behavior as well as the most effective discipline techniques.